Looking across the dark water of Manorfield Pool, I can just about follow the line of the old Roman road as it leaves Little Fenton. 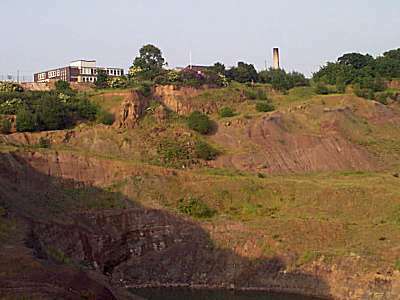 It must have cut across the tip of Fenton Manor Leisure complex, but then it becomes lost in the huge crater of an industrial marl hole. "The road passed where we're standing," agrees my companion, historian Steve Birks. "Then I think it filed along Wintonfield Street and into Station Road. And from here it disappears completely beneath a chaos of road and rail. "But can you imagine how idyllic it must have looked in Roman times set on this lower level of Shelton?" 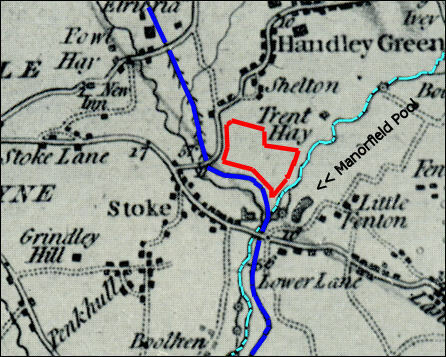 One map, dated 1775, shows a lane leaving the old road at this point along the present Shelton Old Road and through what is now Stoke Road to Snow Hill. The area between this road and the River Trent was known as Winton's Wood and Winton's Field. "Another map dated 1800 shows 150 acres of the Stoke Church estate," says Steve. "A third of this is in the township of Penkhull, a third in Fenton and a third in Shelton. It is this last part that includes Winton's Field and Winton's Wood. At the centre of this today is Station Road, the railway station and the North Stafford Hotel, beneath which the Roman Road is buried." I've always believed this location to be the primary gateway into Stoke-on-Trent and I'm about to find out why it was chosen. "Winton Square was definitely designed to present the best face as you arrived in the Potteries," says Steve. "The station was inspirationally put together to suit the dimensions of a European classical square with Flemish gables fronted with classical columns and a carved stone canopy Although it is modest in comparison with other British terminuses, it is its simplicity that sets it alight." Completed in 1848 by H. A. Hunt and commissioned by the North Staffordshire Railway Company, the station is constructed in brick and sandstone to a beautifully detailed Elizabethan and Jacobean design. It even brought a compliment from one exacting critic of Stoke-on-Trent, Nikolaus Pevsner, who described the Potteries in 1974 as 'an urban tragedy'. 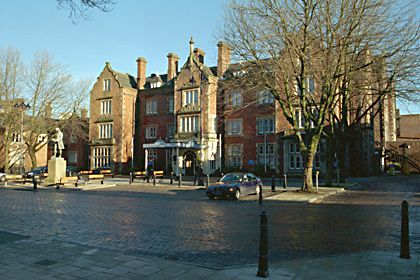 "Despite Pevsner's criticism, he stated that Winton Square was a fine example of Victorian planning in Staffordshire," adds Steve. "And civic and cultural leaders have • acknowledged this by listing no less than eight buildings here." "I mean just look at the splendid North Stafford Hotel, built in the same style in 1849 a year after the station opened." "Stoke-on-Trent possesses one of the finest gateways in the country in Winton Square; step off the train in Stoke-on-Trent and you are met with one of the finest examples of Victorian urban planning you are likely to come across, and two great landmarks in Stoke-on-Trent Railway Station and the North Stafford Hotel, both of which are Grade II* Listed." The name Winton is obviously significant, but where does it come from? The answer to this is provided by one of the city's principal academic historians, Richard Talbot. "Sandale was a beneficiary of court nepotism and patronage. By the age of 20 he was one of Edward II's clerks and became Chancellor of the Exchequer in 1307. Between 1305 and 1316, Sandale was the rector of Stoke and yet he'd probably hardly ever set foot in the parish. How did all this happen? It was through the sponsorship of the powerful Thomas, Earl of Lancaster. "Anyway, in 1316, Sandale was promoted to Bishop of Winchester and as such would sign his name John Winton. Around the same time, the chancel to Stake's Saxon church was redeveloped and the timber would have been cut from the church lands. I believe the area then became known as Winton's Wood because of the connections to Stake's former rector. "John Sandale of course wasn't local. Nevertheless, his appointment as a bishop to the important diocese of Winchester doubtless was used by Stoke parish to reflect connections with Sandale's reputation." Winton Square, of course, is in Shelton and with implausible irony the station looks away from Stoke to face Hanley. "But it's possibly because of the location of Winton Square that Stoke-on-Trent has survived as a city," says Richard. I’m guessing the major pottery industry would have been moved nearer the seaports; the cluster of towns would have continued mining coal independently, civic development would have been arbitrary and just maybe there wouldn’t have been a City of Stoke on Trent at all.